Visit the beautiful village of Villanova d´Albenga. The fountain, around which many restaurants have been set up, forms the centre of the town, The La Spelonca nelle Mura or theOsteria Di Si are popular among tourists, who value ligurian specialities and Italian delicacies. And even the PasticceriaTorrettais bakery is popular among visitors. The municipality lies at the confluence of the Arrosciaand Lerrone streams, and is surrounded by Liguria’s diverse vegetation. 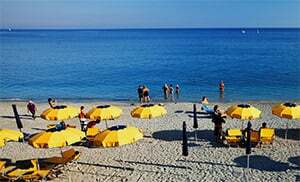 Yet despite the historical and Italian flair, which permeates through the whole town, the town has a modern airport, from which you can reach Rome directly..
Villanova is integrated in the ligurian transport network and can even be reached directly by plane. Nevertheless, the town offers its visitors so much of Italian history and provides vacationers in the hinterland of Savonaa a place of diversity and the relaxation. Tours through the natural environment are equally very popular - no matter whether during hiking or mountain biking through olive groves. Villanova is with approximately 2500 inhabitants one of the most important villages in Albenga, in the Savona province. Already in 1250 the village was set up as a defence point and secured with walls. The town is known especially for its three big churches from three different epochs. This allows the visitors to take a journey through time of the Italian, architectural past. From the gothic epoch, with the Santo Stefano di Cavatorio Church, via the Santa Maria della Rotonda from the renaissance up to the Church of Nostra Signora della Grazie from the baroque epoch, Villanova offers its visitors a variety of building styles. Villanova belongs to the Albenga municipality and is a locality in Savona province which lies in the Liguria region. In the vicinity of Villanova are several other villages like: Garlenda (4.6km), Ortovero (5 km) and Bastia (3.3km). From Genoa take the Albenga highway exit, then StradaStatale 453/SS453 up to your destination Villanova D'albenga.